Daniel Jackson returns from an alternate reality to the SGC with a desperate warning of an imminent Goa'uld attack. 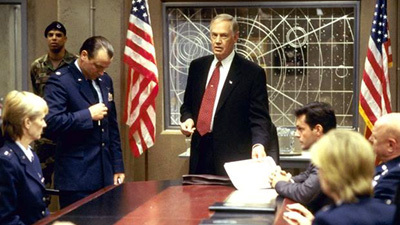 However, the SGC faces a more immediate threat from Senator Kinsey, powerful Chairman of the Appropriations Committee, who oversees the multi-billion dollar budget for the Stargate program. He views the program as wasteful and risky, and as he reviews the past missions with SG-1, he dismisses both the benefits of the Stargate and the danger presented by the Goa'uld. Nothing will sway his position, and he is determined to shut down the program for good. Major Samuels has been promoted to Lieutenant Colonel and transferred to the Pentagon, Stargate Mission Analysis. Senator Kinsey is Chariman of the Senate Appropriations Committee. Stargate Command is an unofficial project designated by the Pentagon as "Area 52" and costs $7.4 billion per year to operate. The first mission to Chulak (Children of the Gods) occurred on February 10th of the current year, (O'Neill's report dated February 23). The mission to the Land of Light (Broca Divide) occurred in March. SG-2 has since returned to Argos and found the Argosians free of the nanocites and leading long healthy lives. With all funding cut, Stargate Command has been officially shut down, effective immediately. And you were there, and you were there, and there's no place like home. Oh, you're right, we'll just upload a computer virus into the mother ship.